2016 Reissue - 180 Gram Audiophile Transparent Vinyl. 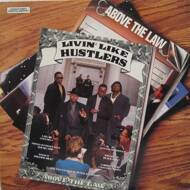 Livin' Like Hustlers is the debut album by the Rap group Above the Law, released in February 1990. Production for the album came from Dr. Dre (who was in N.W.A at the time), as well as Above the Law and LayLaw. In 1998, the album was selected as one of The Source‍ '​s 100 Best Rap Albums Ever. A perfect West Coast Hip Hop record from the Golden Age of Rap.